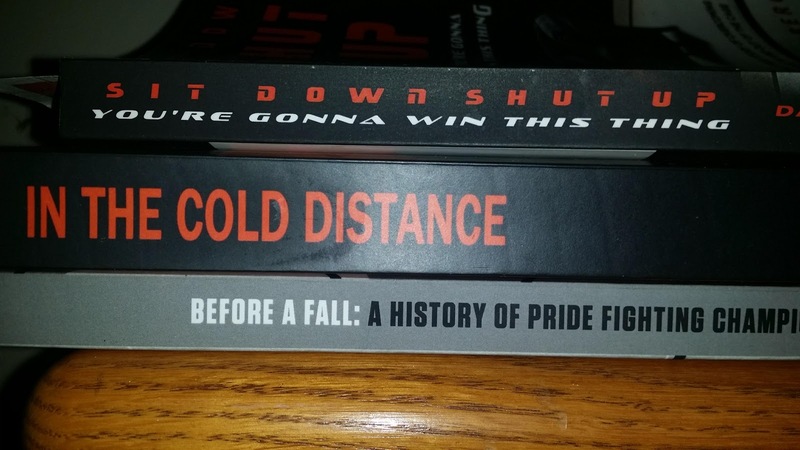 These aren’t instructionals or “how to” books on MMA, these are books about the sport’s history and culture that I have read over the years as a fan and covering the sport. I had the pleasure of meeting, training with, and interviewing some of the authors and I always recommend the books to folks in conversation. With the holidays coming, I figured I would compile a list for folks looking for something a bit deeper than an MMA DVD or tee shirt. I met Genia while covering the ban on MMA getting lifted in New York. He is, in my opinion, the best historian for the sport in the northeast region. I don’t remember where or when he mentioned his book but I remember telling him at the World MMA Expo in New York City when he gave me a shirt that I was going to buy his book. I read it just as the ban was being lifted and you can read the review here. This is the book for people that ask, “What’s the big deal about MMA in New York?” Read the book, and you will have the answer. This is that book and I’m glad he’s having some success with it. It’s not so much about MMA as it is about perseverance. It’s a good “pick-me-up”, from Dave and worth a read. Finley’s style of writing is not one you would expect in MMA, which is why it’s probably so damn good. I read an article Finley wrote about a fighter and friend of his that passed away on the site he was writing for at the time that touched me personally. The timing was weird because I was going through some stuff at the time and something about what he wrote put out a real positive vibe. Months later I had a beer and met the man at the first pro MMA event in New York, later we would have drinks again while covering the same event. Finley’s book is his story on what a crazy world the road can be for one that chooses to write about and get to know fighters. It is also a great roadmap for anyone looking to get into the industry as he shares his ups and downs on the business side and the personal side with being away from family. He’s taken a break from covering the sport and this book was one of the last things he wrote before stepping away. I always think of Finley like Batman in Christopher Nolan’s The Dark Knight(2008), where Batman has run a the end because it’s what Gotham needs. If I have my say, MMA needs Finley right now and that light is shining in the air but the citizens of MMA will have to wait for him to answer the call. Until then, his book makes a great read. Check out the full review here. I found this book purely by chance. I read about the Indiegogo campaign and thought what a great idea to write a book about the greatest Japanese MMA promotion that ever existed in the sport. I shared what I could to create awareness and Daly reached out to do an interview. Daly returned to talk about how successful the campaign went and the book was released during Bellator 208 where Fedor Emelianenko advanced to the finals of Bellator's heavyweight tournament. The book's history gives a lot of insight on what is currently happening with the Tenshin Nasukawa vs. Floyd Mayweather Jr. news that seems to be on and off at the time of writing this. Highly recommended for new fans of the sport that wonder what "Pride Never Die!" means. If you liked these recommendations check out my Amazon Storefront for my recommendations on Brazilian Jiu-Jitsu and MMA gear, supplements, books, and more!